Not that long ago, a review of an audio rack would have been as well received as a space heater in Phoenix in July. Today, however, most audio enthusiasts no longer simply dismiss as necessary evils such things as power cords, cables, room treatments, or isolation products. When correctly designed, matched, and implemented, such accessories can be as sonically significant as any other system component. Yet, for many audiophiles, an expensive equipment rack is likely to remain the final purchase frontier; theyre convinced either that it wont make a noticeable improvement in the sound, or that if it does, the sonic benefit wont justify the cost. But while this may be true in certain cases, those audiophiles who dismiss too quickly the idea of buying a high-quality rack may be doing their systems a disservice. Early in my audio addiction, all I thought I needed was a nice-looking, relatively sturdy rack that would hold all of my components. My main objective was to get my gear off the floor and, hopefully, not create an ugly wall of equipment in the process. If I wanted to address vibration or attempt any resonance control, I used some combination of cones, pucks, and/or footers between the rack shelf and the component. While I gained some sonic improvements with this approach, I also consistently paid a high sonic price. In the years since, many racks have been through my doors: racks made of sand-filled metal, carbon fiber, air suspension, and hardwood, and with shelves made of acrylic, glass, MDF, or other composites. Some have also incorporated everything from Sorbothane footers to metal cones or ball bearings to magnetic or strung levitation devices. And I admit it, like any other isolation product, even a good rack can introduce as many sonic anomalies as improvements. Not so with Silent Running Audios Craz 4 Reference isoRack plus ($4000 USD and up depending on wood species and size). You mean I dont just need four MDF shelves and a few cones? As my system evolved, so did my expectations for my equipment rack. I couldnt help thinking that if a rack has been designed properly in the first place, I shouldnt need to fix or tune each shelf with $800 pucks or cones. This process led me, six years ago, to Silent Running Audio (SRA). At the time I had a moderately priced rack with sand-filled columns and spiked MDF shelves, the rack in turn spiked to my audio rooms concrete slab. Although I was wondering if a new rack would be more functional, I wasnt ready to shell out big bucks for one. Instead, I was looking for something to isolate my amplifiers (which sat on brass cones spiked to the slab) and was considering a number of different isolation products. I ultimately decided on SRAs VR Series of component-isolation platforms, a decision based on months of research. In the end, I was convinced by the unique qualifications of SRA owner-designer Kevin Tellekamp and the applied science underlying his designs. I began with my Lamm hybrid power amplifiers. Sitting directly on my concrete slab, SRAs component-specific, custom-made VR platforms performed so well that I upgraded them a year later to SRAs top-of-the-line Ohio Class XL plus² isoBases, which I still use today. It is these custom-made, single-component platforms that SRA is best known for. SRAs VR and Ohio Class XL plus² isoBases use highly sophisticated raft suspension systems which are able to instantaneously change their darometers (i.e., their softness or firmness when in a static state) in response to vibrations and resonances generated by or through the component. Based on Newtons idea that for each action (vibration) there is an equal and opposite reaction (vibration), these complex suspensions are manufactured using high-tech software programs. The exact weight and dimensions of your particular component right down to the weight distribution and location of internal parts are taken into consideration in the design and implementation of the platform. Through this ultra-precise counter-motion technology, SRA claims, vibration is effectively and efficiently dissipated as heat. Is vibration really the enemy? I can understand that vibrations can be the scourge of vinyl playback. The microscopic physical variations in an LPs groove are the source of the signal, so its easy to understand that the vibration of anything other than the stylus, cantilever, and magnets/coil will affect or alter the musical message. But, what about a solid-state amplifier? If a resistor, capacitor, or transformer is vibrating, does it matter? Does the resistor stop resisting or the transformer stop transforming? Will it really be detrimental if an amplifier is subjected to the earths, or worse yet, your audio rooms vibrational energy? Yes, if you want your music delivered unadulterated. When an electronic components chassis, internal parts, or even internal wiring is subjected to air- and structure-borne vibrations, nonmusical energy is transmitted and amplified through your system. If, like most of us, youre on a quest for musical truth, introducing such nonmusical energies into your audio playback will take you further from, not closer to, that goal. SRAs Kevin Tellekamp has degrees in physics and chemical engineering, and has been working in high-profile government applications for more than 15 years. Through his affiliated companies, Tellekamp is under contract with the US Defense Department to provide, among other things, resonance control for $1 billion nuclear submarines. SRA also provides extensive OEM resonance-control solutions and other services for a number of high-end audio manufacturers, including Sony, Mark Levinson, EMM Labs, Ayre, and Aesthetix. Given this background, I figured I might just be able to trust him with my amplifiers. While its exterior exudes elegance and style, its the Craz References interior that is all business, an engineering and techno-geek dream come true. The Craz is a resonance-killing system comprising five component parts designed to work together to eliminate from your systems audio playback any nonmusical information. These five component parts, described below, are the shelves, frame (including the titanium isoSkeleton), footer assembly, Mass Load Support System (MLSS), and isoPods. Every Craz isoRack is made to order based on the buyers specific component-isolation requirements and limitations of size and space. 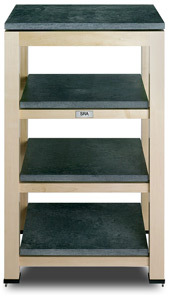 The size of each Craz shelf is determined by the buyers requirements. Based on a standard thickness of 1.25", each shelfs weight can be increased or decreased depending on need, as determined by SRAs modeling software. The shelves are made of energy absorbing, nanoparticle composites i.e., materials made of microscopic particles (spheres) whose size is measured in nanometers (a nanometer is one-billionth of a meter, or 0.000000001m). The material has a dense, complex, irregular-void matrix structure. In other words, the "void" around each nanoparticle is, in effect, an air pocket. SRA has engineered the size and density of these pockets to defeat the propagation of vibrations. They claim that this immediately drains away equipment-borne vibrations. The choice of shelf technology and the development of this custom nanoparticle material was based on SRAs experiments with many other materials. According to Tellekamp, that experience indicated that other materials typically used in equipment racks, like Kevlar, carbon fiber, crystalline substrates, acrylic, etc., resulted in unsatisfactory resonance control and produced unwanted sonic colorations. SRA discovered that shelf-less designs introduce problems at each contact point, including moving and locking parts. They believe that, in a shelf-less rack, weight and stress create "contact-point fatigue," which begins when the rack is built and only worsens over time. SRA also eschews triangular designs because such racks, regardless of engineering or exotic materials, are prone to rock. (This is called cantilevered mass, as two corners inevitably want to rock.) The Craz Reference comes in two standard models: The Craz 4, which holds (at least) four components, one each on four shelves; the Craz 8, which holds (at least) eight components, two each on four shelves. Additional sizes and configurations are also available. SRAs standard frame material, chosen for its superior isolation and sonic characteristics (i.e., the sounds it doesnt make), is a hard white maple, although other hardwoods can be used if necessary. SRA hand-picks extremely stable, 15-year-old, air-dried maple from 12" logs that are milled to the core for increased density and rigidity. The exact thickness of the frame supports and legs depends on the individual Craz References size and the customers needs. Think of a bridge: The sizes of its supports will vary according to differences in height, length of span to be supported, and pitch. The supports and legs are connected with oversize dovetail and mortise-and-tenon joinery, which avoids the need for nuts, bolts, or other resonating connectors that can fatigue over time and cause seismic difficulties at their contact points. What makes the Craz frame unique is not its stunning good looks and superior workmanship, but what lies beneath. Inside every Craz frame is a titanium isoSkeleton. The isoSkeletons horizontal titanium tubes run the full width (left to right at each shelf location) of each Craz, with a hole at each end to allow the vertical tubes to pass through. The tolerances for the holes are extremely tight, and the titanium tubes are coated with a custom adhesive that, when it dries, becomes almost as strong as the tubes themselves. The isoSkeleton, which is injected with three different viscoelastic damping gels, allows SRA to fine-tune to specific target resonance frequencies. The layers of different gels are intended to address different frequencies. For example, as floor-borne vibrations attempt to migrate up the isoSkeleton, the bottom layer of gel ameliorates the bass frequencies, and so on up through the frequency spectrum. Like the Craz References other elements, the size and specifications of the four footer assemblies depend on the size of the individual Craz and the customers requirements. Each assembly is internally damped with two adjustable spikes, one outside-front, one inside-rear, allowing for finer adjustments on uneven floors. Only a small part of the assembly contacts the frame itself, a high-pressure fitting links the assembly to the titanium isoSkeleton. This unique approach conducts floor-borne vibrations into the isoSkeleton for ultimate dissipation and elimination, as outlined above. At each corner of the Craz, and at equidistant intervals in wider Crazes, as in the unit reviewed, are the user-adjustable supports on which rest the isoPods (described below). The Mass Load Support System (MLSS) doubles as a vertical-motion isolator. Dictated by known applied forces, a mass (e.g., the shelf and associated components) compresses the MLSS to a predetermined "work position." These supports are machined from Alpha SL aluminum billets or titanium, or a combination of those metals, and are finished with an acoustical coating. Each MLSS is designed around the specifics of each Craz to ensure the necessary flex and rigidity for each shelfs size, weight, and load. The MLSS is outfitted with user-removable stainless-steel machine screws for easy and precise adjustment of the isoPods. Sitting atop the MLSS and supporting each shelf is an isoPod, an SRA invention originally conceived for a classified military application and since re-engineered for use in the Craz isoRACK. The isoPod was designed around SRAs patented thermal-reactive urethane hybrids. Unlike materials such as Sorbothane, the urethanes used in the isoPod, which have been tested from 500°F to -459°F (absolute zero), are unaffected by fluctuations in temperature or humidity, and their effective life span is at least 100 years. Because of its unique composition, an isoPod targets the customers specific requirements based on the parameters given to SRA. Equipment type, construction, and flooring details are all taken into consideration in matching individual isoPods to an individual Craz Reference. When first developed by SRA, the isoPod operated within an effective performance range of +/-ten pounds. Through further research, SRA discovered that it could produce a 10% increase in performance (at this level of audio, a huge improvement) by bringing the target weight range down to +/- two pounds. In real-life terms, if SRA used four original isoPods on a Craz shelf supporting a 100-pound component, its effective performance window fell within a range of 60 to140 pounds. However, by applying the tighter weight range (+/- two pounds), SRA was able to increase the effective performance range for that same 100-pound component to a target range of 92 to108 pounds. Because the isoPod is modeled for both load and weight, each isoPod operates as a multiple-degree-of-freedom system targeting unit-specific criteria. What all this means is that a Craz Reference is much more like a high-powered rifle than a shotgun in your vibration-fighting arsenal. Finally, the isoPod is the component of the Craz system that allows the end user to modify or adapt the Craz to accommodate changes in components, weight load, and distribution of gear. The isoPods originally sold with a Craz are specific to the buyers load and application needs. Should the owner then change components, or if the owners specific requirements change in some other way, new, custom isoPods can be delivered at no cost within 48 hours through SRAs isoPOD trade-in program. I know of no other company that provides this level of customer service. Each Craz Reference is shipped in two ultra-heavy-duty crates. Virtually no assembly is required, all the customer need do is set the shelves atop the isoPods on each level of the frame, which takes no more than 15 to 30 minutes from start to finish. The enemy has been engaged, but is it dead? The beauty of designing a product to accomplish a specific verifiable objective is the ability to test your results to see if youve accomplished that mission. If nothing else, Silent Running Audio is all about testing, retesting, and testing again. SRA routinely measures and tests performance parameters in order to validate the Craz Reference and the compliance of the raw materials used in it. Each Crazs parts are optimized via several computer modeling programs, allowing SRA to separately fine-tune each element of a Craz. This lets SRA know how a Craz will perform before SRA builds it and ships it to the customer. During this stage, SRA tests parts and subassemblies for resonant frequency problems and baselines, dynamic propagation, isolation effectiveness, frequency response, time domain, impulse response, mechanical impedance, and acoustic impedance. Simple qualitative tests and measuring changes in attenuation are easier to perform and are far more reliable when made before a Craz is finally assembled. In addition, because each Craz and its component parts are designed and built to order, SRA also performs tests specific to that unit. These exhaustive, time-consuming procedures assure the SRA customer that his or her Craz performs as it was designed to. The enemy is dead: the sound of extinction? The first thing I noticed with the Craz in place was the ease with which I could hear the musical information on my reference recordings. It wasnt that I heard all sorts of things that Id never heard before from those CDs and LPs; what stood out was the way the Craz allowed me to hear the familiar information on those recordings. The sound of my system was less forced, less strained. Have you ever rented a U-Haul truck? Their engines have governors that keep you from exceeding the speed limit. You know the engine has the power to go faster; you also know that it is being artificially constrained. With the Craz, it seemed as if a sonic governor had been disengaged. The music flowed in such a way that images floated on the soundscape without intrusion. This freedom created the illusion of an enlarged soundstage that still was not unnaturally broad. I speculate that what let me hear the musical information on my reference recordings with less strain were the lower levels of nonmusical energy being amplified. It was easier to discern words or notes that I may have heard before, but at the same time those words and notes were less analytical. This effortlessness lowered my shoulders, letting me relax and immerse myself in the music rather than be distracted by listening for audiophile tricks. Treble delicacy and finesse improved while treble energy decreased with no loss of extension or resolution. The Craz made cymbals sound more realistic than Id ever heard through my system. On "Nova," from Bobby Lyles Ivory Dreams [LP, Atlantic 81938-1], Michael Baker is extremely active on his entire drum kit, but much of the musics energy comes from his cymbal work. Through a system with any hint of excess treble energy, glare, or distortion, these passages can be tiring at best and painful at worst. With the Craz installed, I was able to relax, enjoy Bakers cymbal work, and, more important, enjoy the trio rather than be distracted by the drummer. The cymbals had all the sheen and crispness you hear from the real thing, and none of that hyper-metallic sound so often generated by more "analytical" equipment. The upper frequencies werent rolled off; they just had less glare. On the other end of the spectrum, the bass response was simultaneously more taut and more harmonically rich. Bass pitch and attack improved. Whether on large-scale classical pieces such as A Sussex Overture, from a collection of overtures by Malcolm Arnold with the composer conducting the London Philharmonic [CD, Reference Recordings RR-48CD], or on intimate jazz-trio recordings such as Harvey Masons latest effort, the outstanding With All of My Heart [CD, Bluebird 82876-52741-2], any residual bloat or overhang was gone, leaving intact the natural overtones and decay. The attacks and developments of bass notes werent too fat or too thin, but just right. As the old adage goes, the magics in the midrange. If thats true, the Craz Reference was the David Copperfield of isolation products. From the lower through the upper midrange, everything was weightier but somehow lighter on its feet; less in my face it gave the music more drive, less edge. This characteristic also gave violins, violas, and cellos better body and more richness without making them sound slow or unnatural. With the Craz, I could turn the volume higher before hitting the Wince Threshold, which tells you to dial it down a notch. For example, Im a fan of Doctor Funk, a ten-piece Seattle funk band. With the Craz in place, the trumpets and baritone sax on their first album, Prescription for Soul [CD, Strokeland 1004], had more substance, more bite, and therefore more soul all with less edge. It all began to add up: Remove the adverse effects of vibrations from the music and you get sound thats richer, more natural, more harmonically accurate, and more realistic. What I find most difficult to articulate about the effect the Craz Reference had on my system is how it produced seemingly mutually exclusive results that nonetheless complemented each other. When I replaced my Arcici Suspense Rack with the Craz, I noticed that voices and instruments sounded more distinctly "separate." The initial attacks, developments, and decays of each voice or instruments notes occupied its own space without intruding on the other performers spaces, yet these various "separatenesses" managed to meld together to form a whole more cohesive than before. As a former professional musician, I thoroughly enjoyed and appreciated this effect. It allowed me to both enjoy the individual performances and not feel disassociated from the overall presentation. At the end of the day, all the marks were on the Pro side of the ledger. My review system for this article comprised Kharma Exquisite 1D-E.d speakers, Lamm 1.2 Reference monoblocks, Conrad-Johnson ART-2 line stage and the Aesthetix Io Signature phono stage, and a Reimyo CDP-777 CD player. Vinyl was spun on an SME 30 turntable, SME IV tonearm, and a Dynavector XV-1s cartridge. Cables and power conditioning included Kharma Enigma speaker cables, Silversmith Palladium and/or Kharma Enigma interconnects, Harmonix X-DC Studio Master AC cords, and a Reimyo ALS-777 power conditioner (CD player only). Is the Craz 4 Reference isoRACK plus the resonance assassin for you? Like a physician, an audio product should "First, do no harm." In six months of listening I found that Silent Running Audios Craz 4 Reference isoRack plus destroyed the negative effects of vibrations while doing no audible sonic harm at all. I found no downside to using the Craz other than its price. Is it expensive? Yes. Is it unreasonably so? I say no. At this level of audio obsession, most people can easily justify a $5000 preamp or a $6000 turntable. In fact, many have paid more than that for power cords or interconnects. Considering the complex, sophisticated technology underlying the Craz Reference, and that each one takes 200 hours to manufacture, and that the result is a museum-quality piece of craftsmanship that will likely stay in your system for the long haul, the Craz may be one of the smartest audio investments youll ever make. Add to all of that the fact that it will likely improve the sound of your system as much as or more than any other component upgrade, and its not hard to justify the price. Is it for everyone? No, nor is it designed to be. The Craz 4 Reference isoRack plus is for the discerning audiophile who wants not just a storage solution but a custom-made, easily adaptable, technologically advanced, scientifically proven, resonance-control system with lethal vibration-killing prowess, all in a visually stunning and elegant exterior. I think its worth every penny. We are most grateful to Ultra Audio for Frank Perainos thoughtful review. Everyone at SRA is very excited to hear that the Craz Reference isoRack plus has received the Select Component award. During our 15+ years in the isolation game, weve received countless phone calls and emails from customers frustrated in their attempt to find fully functional, aesthetically pleasing, true audiophile-grade equipment racks. Weve heard things like "You guys already produce the worlds best isolation products. Why not build an ultra-high-end equipment rack?" Leaning heavily on our backgrounds in psycho-acoustics and electrical, mechanical, and chemical engineering, we launched a design project that, as it turns out, occupied over two years. It was not time wasted. We have always understood that determined engineering and materials-application result in superior performance. Even so, the Craz project delights us as much as anything weve ever done. Nor have our efforts gone unrecognized. The Craz Reference isoRack plus occupies a place of honor in the homes of serious audiophiles and industry pros the world over. Simply put, a sonically accurate starting point is critical to optimal sound reproduction. Each Craz unit is designed with an eye toward the future. Simple isoPod exchanges afford the audio enthusiast the ability to experience the highest possible isolation potential, through any number of system iterations! The one component in your system you will never change? Perhaps.